Vitamin D3 can provide many substantial health benefits including stronger bones as it improves your body's natural ability to absorb calcium, immune support, cardiovascular health and the prevention of Vitamin D deficiency. Getting enough vitamin D, however, is a challenge especially in northern climates. While vitamin D2 can be found in fortified foods like milk, juices and cereals, the body requires sunlight in order to produce essential vitamin D3. Vitamin D is a fat-soluble substance, which means that a base of fat/oil is an ideal carrier to supply vitamin D to the body. Medium Chain Triglycerides (MCT) provides a distinct advantage for people wanting to ensure optimal absorption of their vitamin D supplement. MCTs are absorbed passively from the gut requiring no energy, enzymes, or bile to be absorbed. Compared to Long Chain Triglycerides, which must be absorbed via the lymphatic system, MCTs are absorbed directly from the G.I. tract into the portal vein by passing the slower lymphatic absorption path of LCT. 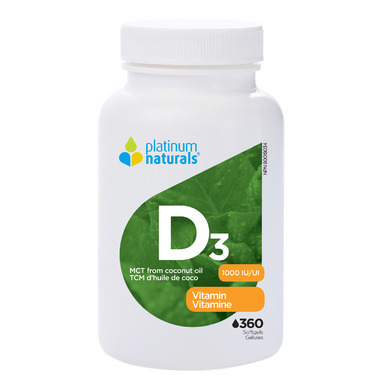 Thus, improving the absorption of Vitamin D.
Platinum Naturals’ Vitamin D3 provides you with 1,000 IUs of vitamin D that is free of additives and is suspended in coconut-based oils for easy absorption. Vitamin D is one of the fat soluble vitamins along with E, A, and K.
It’s essential in forming calcitriol, the hormone responsible for calcium absorption and utilization. The UV rating must be above 3 for sunlight to be effective in producing vitamin D in our skin. Recommended Adult Dosage: Take 1 capsule daily. Non-Medicinal Ingredients: Medium chain triglycerides. Capsule Ingredients: Glycerin, gelatin, purified water. So pleased with this brand. They are cute (pills can be cute?) and easy to swallow. Love that they are in MCT coconut oil. Platinum Naturals has a very high quality vita D and have used this brand for years. Very happy to find them on well.ca and at a good price. I am very happy with well.ca's service and delivered right to the door. Love that this product is in MCT oil! I give them 5 stars, no vanilla smell like other brands, I take them every day! Liquid vitamin D is more easily absorbed into our system. This vitamin D is in coconut oil and unlike other suspension liquids this is less likely to spoil, so I feel much better taking it.